Training with proper technique will make you smooth, fast and deadly. If the best way to win a gunfight is to not be in one, then the second best option is to get the first good hit. Notice that I didn't say to be the first one to get a shot off. You need hits—several of them, actually—and they need to be properly placed. And getting good hits starts with a good draw. Seemingly innocuous on the surface, the drawing of a firearm from a holster is one of the most potentially dangerous elements of gun handling. Speed and safety can be, and often are, diametrically opposed to each other. Staying safe and shooting accurately is not difficult; it just takes knowing the right technique and practice—lots of practice. The traditional draw stroke has the gun traveling from the holster to the shooting position in a straight, diagonal, upward stoke. The problem with that technique is twofold: First, the gun will not be in a good firing position until the arm is nearly fully extended, so even a close threat can not be engaged with very much effectiveness; and, second, in tight confines, such as behind a steering wheel or table, the gun is likely to hit the object and foil the draw. While that traditional draw has been with us for several decades, a new method, the right-angle draw stroke, has been gaining popularity for the last 10 years or so. The right-angle draw, sometimes referred to as the close-quarters draw, has the gun angled toward the target as soon as the gun clears the holster. The gun is drawn up the side of the chest along the ribcage, where it meets the support hand, then extends toward the target as far as needed, but can be fired effectively just out of the holster. The right-angle draw is my preference because it has the gun on target much faster than the traditional method and the gun will clear close objects, since it's tucked tight to the chest before the extension. A proper grip is essential to putting rounds on target. The gun should be placed in the web of the hand in line with your arm's skeletal structure. Your hand should be high on the gun's grip; the closer your hand is to the slide axis, the more control you have over recoil. Your fingers should grasp the gun tightly, with your middle finger pressed tightly upward under the trigger guard. Your thumb should be along the side of the gun pointed at the target. To start the draw, life the gun straight out of the holster. If your fingertips are not turning white, you are not gripping tightly enough. Target shooters, not concerned with recoil, prefer a loose grip because it offers better trigger control. Defensive shooters are more concerned with recoil control for fast follow-up shots than with extreme accuracy, so the tight grip works best. With a two-handed grip, your support hand should wrap around your gun hand. The index finger should be pressed tightly upward under the trigger guard and your thumb should be underneath your strong hand thumb and pointing at the target. Don't just stabilize the gun with your support hand; use it to strengthen your grip which will help to control recoil. Your support hand should actually tighten your dominant hand's grip by squeezing it. When the gun clears, angle it toward the target. The first action in the draw stroke is actually a combination of three actions that should happen simultaneously. One, your body should shift into a combat position by moving your weak-side leg forward and outward into a slightly open stance while leaning your upper body forward to distribute your weight for recoil absorption. Two, your support hand should be placed against your chest to keep it from straying out in front of the gun. This position also readies it to meet the gun as it rises. Three, the gun hand should have a proper grip on the pistol. If the grip on your gun is not good it is important to re-grip before you draw. It never works to try to re-grip after the draw, and to start shooting with a bad grip means that you most likely won't make your hits. With all the other movements in place, it's time to lift, meet and extend. Lift your gun straight up out of the holster. Once it has cleared, angle the gun upward at a right angle toward the target. Slide the gun upward along the side of your chest and meet your support hand at the center, or right of center, of your chest. (Left of center if you are left-handed.) Extend into your line of vision and toward the target. is ready to be fired once it has left the holster and has been angled upward toward the target. Actually, once that is done, the gun can be fired anywhere along the rest of the path toward full extension. And if you want a good retention position, all you have to do is stop the gun once it has cleared the holster and has been angled toward the target. Slide the pistol up and along your chest to meet your support hand. These are the building blocks of the two-handed draw. Even though most people shoot better with two hands—myself included—it is important to practice one-handed draws because your support hand may not be available in a fight. It may be injured, might be controlling family members or other bystanders, may be carrying something, dealing with light switches and door knobs, or, very likely, may be engaging the threat directly by exerting forward pressure or striking the assailant. I often practice drawing at close distances while striking the target with my support hand to simulate such an event. sponse in your dominant hand, helping tighten its grip. While working on these fundamentals, be mindful of other basics such as trigger control. In the case of a single-action trigger, the trigger should press against the middle of the pad of your trigger finger. I find that when using a double-action trigger, the longer, heavier trigger is best placed against the first joint. Some instructors prefer the trigger pressed against the middle of the pad regardless of the trigger type. Test both and use whichever works best for you. Extend your arms toward the target and lock on. There's also the issue of the safety. There are several theories regarding when the safety of a gun should be disengaged. I'm not a fan of disengaging the safety during the early stages of the draw stroke, as the gun may not aimed in an appropriate direction. My preferred technique is "on target, off safety/off target, on safety." In other words, disengage the safety only when your gun is pointed at the target target. If your gun has a decocking mechanism, decock the gun just as soon as you are finished shooting or before bringing the gun off the target if you haven't fired. When it's time to reholster the gun, simply reverse the procedure. Bring the gun back to your chest with both hands still on the gun. Remove your support hand and place it on your chest as you slide the gun across and down your chest. Rotate the gun downward and insert it into the holster. Don't use your support hand to guide the gun into the holster, as the muzzle will most likely cross your hand. If your holster requires a second hand to hold it open, throw it out and get a holster with a reinforced opening. So that, really, is all there is to it. For new shooters, I recommend that the draw be dissected into sections and practiced one step at a time in reverse order. Start by holding the gun in both hands at the chest, remembering to grip the gun properly. Extend the gun upward into the line of vision and toward the target. Pull the trigger once the sights are on target and your arms are fully extended. Practice this 10 to 20 times. Start slow and increase speed only after you have gained confidence. Next, start with the gun on the side of your chest and your support hand flat on your chest. Move the gun toward the center of your chest and grip the gun with the support hand. Extend toward the target and press the trigger. Do this for 10 to 20 repetitions. The third part starts with the gun just above the holster and pointed down toward the holster with your support hand flat against your chest. Angle the gun up, bring it up the side of your chest, meet the support hand and extend. Once you are comfortable with those increments, continue the process by beginning with your hand on the gun while in the holster. Finally, start in a relaxed body position, then get into a combat stance with your support hand on your chest, grip the gun and complete the draw stroke. The only difference between a one-hand grip and a two-hand grip is the use of the support hand. Body and leg position should remain the same. Slow and smooth movement is the key. The smoother you go, the faster you can hit well. Slow is smooth, and smooth is fast. While that may sound odd, fast movements tend to be jerky and overextend your movements. The resulting shaking and repositioning actually takes more time to correct than if you had drawn smoothly. A smooth draw means that you won't have to correct and compensate for unnecessary movements. Speed and accuracy will come with practice. Once you're comfortable with the draw, don't forget to practice clearing your concealment garment as well. If you use a vest, swing it open hard enough so it completely clears your gun. I add 10 to 15 quarters in both side pockets of my vests and coats for added weight to help the swing. Your trigger should be on high on the slide or cylinder throughout the draw, starting with when the gun is in the holster. If you use a pullover garment such as a sweatshirt, be sure to pull the garment as high up as possible. The exaggerated movement will be useful under the stress of a lethal encounter. Even though it is easer to lift a pullover garment with the support hand while drawing with the gun hand, it is my preference to do both with the gun hand. As I mentioned previously, your support hand may be busy with other vital tasks. The difficulty—and what takes extra practice—is that you have to lift the garment and then grip your gun before the garment falls back down. Whether you use a vest or pullover, grasp the material firmly, as a light touch will most likely get fouled under the high stress of a lethal encounter. There are a number of precautions you need to keep in mind when working on your draw. The most important one is to make sure that when first gripping the gun, your trigger finger is on the outside of the holster in a position that will be high on the slide or cylinder once the gun is drawn. Your trigger finger should be positioned on the holster just as though it were on the gun. This goes for reholstering as well. Having a finger on the trigger while putting the gun back in the holster is one of the most common causes of negligent discharges. muzzle pass across your feet, legs or any other parts of your body. And, again, never use your support hand to guide the gun to the holster because it will no doubt get in front of the muzzle. If your gun has a cocked external hammer, such as on a 1911, place your thumb on the hammer when reholstering to keep it from dropping in case of an accident. If your gun does not have an external safety to prevent the slide from moving, the friction of the holster may push the slide back during reholstering. Place your thumb on the rear of the slide to hold it in place. 't have. Once you have built your skills with the proper technique, practice unorthodox methods and positions. When clearing a vest or jacket, swing it far out of the way to give y ourself enough time to grip your gun. Start off practicing new movement patterns slowly—very slowly. Concentrate on performing all of the motions perfectly before increasing speed. The ultimate goal of practicing any physical movement is "unconscious competence," also known as "muscle memory," meaning that you have repeated the motion so often that your body automatically knows what to do without thinking. 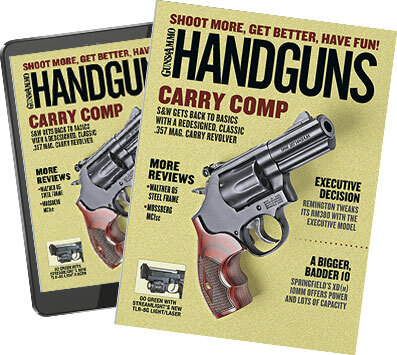 The 3,000 or so repetitions it takes to achieve unconscious competence are vital because you need your concentration to be focused entirely on the threat and not on trying to get your gun out of the holster. I can't stress enough the need to do this all safely. Always start practicing new techniques with unloaded firearms. Move to live fire only when you've achieved competence at adequate speed. When you transition to live ammo, start again at very slow speeds. Always practice for accuracy. Speed will come with competence. If you are not hitting the A zone with every shot, you are going too fast.